I wanted to write a prologue here, on the motivation for this blog post. For some reason, I couldn't formulate it in a way that we would call "politically correct". To give you some context: in the last months, I've been developing a high-profile app for a governmental institution, during which I needed to do quite some R&D on the do's-and-don'ts of mobile development. So I took my Android phone and connected it to my computer, and found to my surprise that some of the apps where spawning results from REST services to their logcat, which included confidential information. Astonished I looked a bit further, how easy would it be to fetch the application from a non-rooted device. Quite easy so it seemed. "WTF?!" was about the only thing that keept going through my mind. 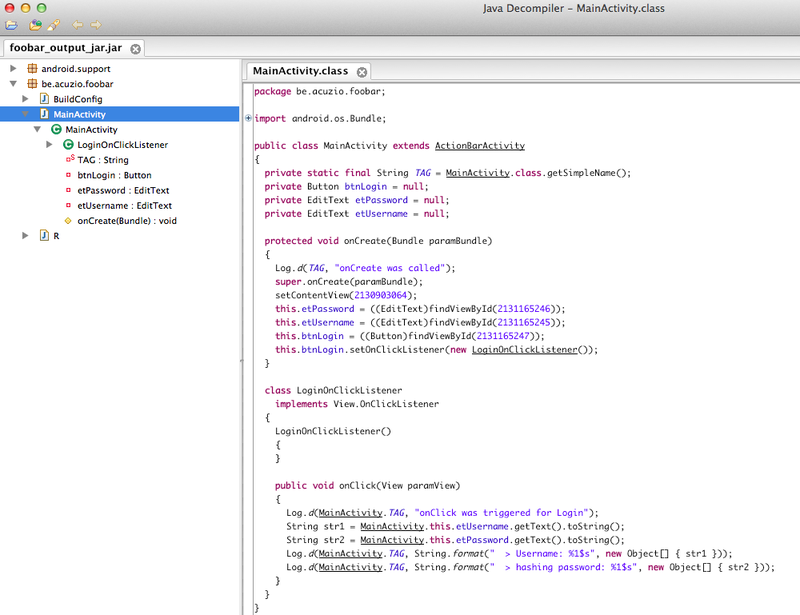 How could we be so sloppy in developing Android applications! Are we ignorant of the available tools? Or are we just lazy? Or are we not specialised enough? Catching my drift here? So it was quite difficult to write an intro here. This post will try to provide some insights in decompiling an APK file and securing your app using proguard. PS/ This is not the Holy Grail of app security. It helps you in delivering higher quality apps. But it is still up to you to use your common sense. If it needs to be secure, or the information is sensitive: don't store it. Period. That's my advice. When you install an Android application from Google Play, you download an APK file. This APK contains the assets (images, layouts, etc) and code (DEX-file) required for your application to run on your Android Smartphone. An APK is "no more" than a ZIP file constructed using your favourite IDE (e.g. 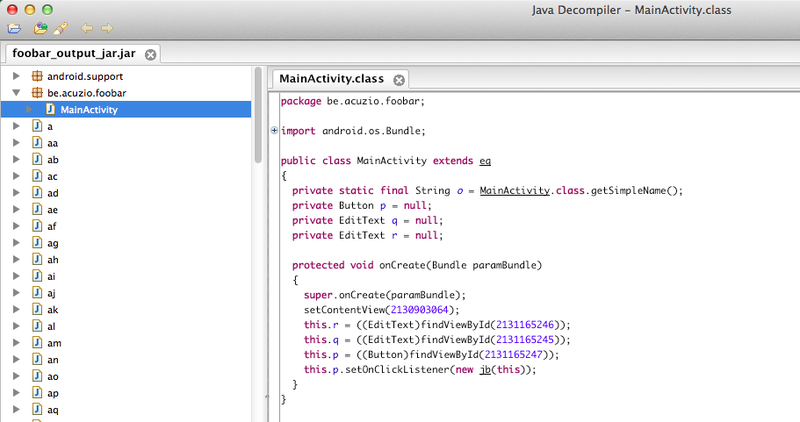 Android Studio & Gradle) which respects a certain structure. Some believe that you need a Jailbroken or Rooted device to download the APK, but that's actually not the case. 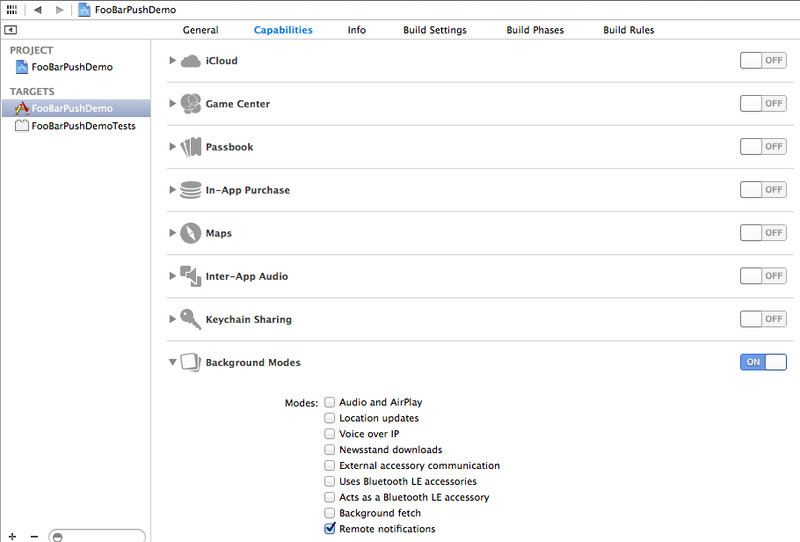 The Android SDK is shipped with the required tools to download the APK from your mobile device. Start a Terminal window and go to the "platform-tools" folder (if it's not in your path, that is). Connect to your smartphone using the "adb shell" command. O Package, where art thou? drwxr-xr-x   9 vandekr  staff   306B Feb 10 20:05 .
drwxr-x---@ 14 vandekr  staff   476B Jan 21 10:24 ..
Eh, voila, you are now the proud owner of the zip APK file. Unzipping the APK is one thing you can do to check the internals of the app. 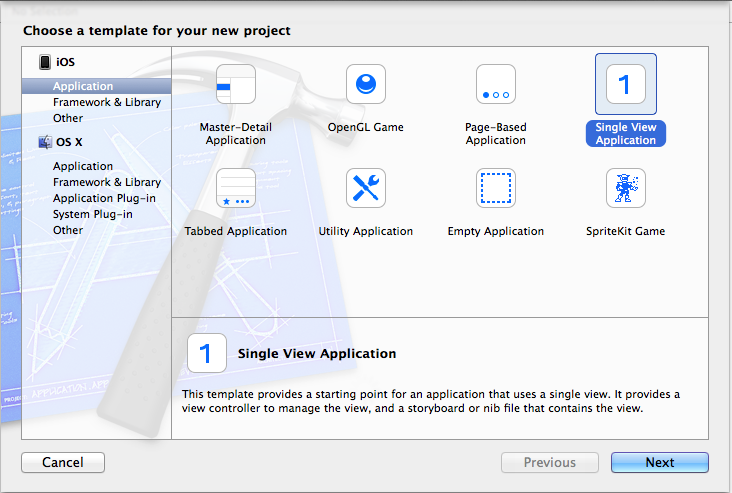 If the app was developed as a native app, you can use the dex2jar and JD-GUI tools to have a look at the code. Start the JD-GUI tool and open the created "output_jar.jar" from your desktop. Now that looks like readable code to me. Let's have a look at the actual code. Even without much effort, you can read and understand the decompiled code. It's not even that much different from the actual code. So let us talk about what we can do to make it more difficult to decompile and understand. Note: it's a way to optimize your code and avoid data leaks via logging. By no means what so ever is it an encryption of values. A stubborn developer with enough time on his/her hands will still be able to figure your code, even when it is obfuscated. Proguard was chosen by Google/Android as the preferred framework for code obfuscation and mimification. Proguard is not the only framework available for obfuscation: a more complex (and commercial) version is DexGuard. You use libraries to facilitate your development. Sometimes you just need a small portions (e.g. Bouncy Castle encryption, Apache Commons libs, Custom JAR files, etc) of the provided libraries. During development, you might have URL's, passwords, hashes etc stored clear text in your application to secure the communication between the app and the remote service. You've worked very hard (for a client), and you're not snappy on the idea of sharing your code with the world. # numbers in the stack traces. # You can comment this out if you're not interested in stack traces. 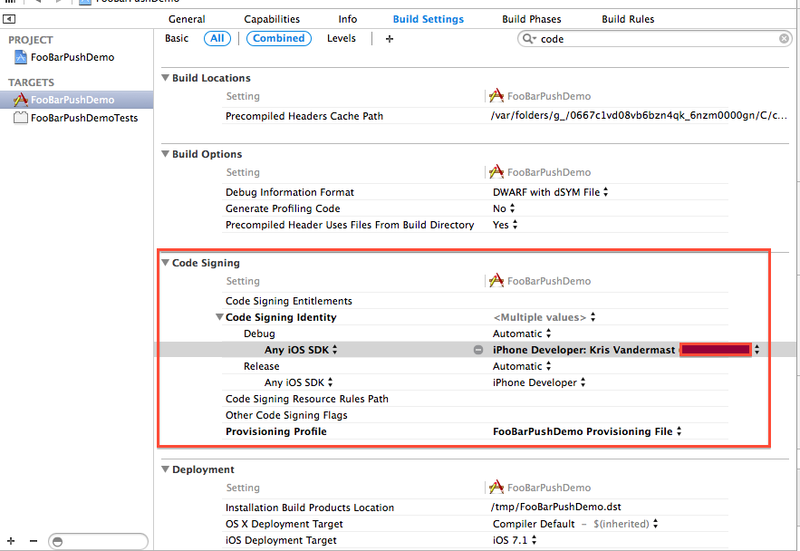 Having a proguard file is just one thing, you need to activate it during your build. I do suggest that you add a proguard file to your debug assembly: because of its intrusive nature, you really need to test your app after the obfuscation. If you deploy the app to a device or run the assembleDebug command, a new APK will be built using the proguard settings. The .apk will be stored in the "build/apk" folder of your app project. Now that already looks a bit better! The names are obfuscated, but the methods and classes that are required by the AndroidManifest or the Android ecosystem are kept (e.g. onCreate). The packages are flattened and renamed, so happy hunting if you have a complex project! And now you are done. Have a developer account at Apple. The certificates open an SSL connection over which a payload is sent. Save the exported key in the same folder as the CSR. 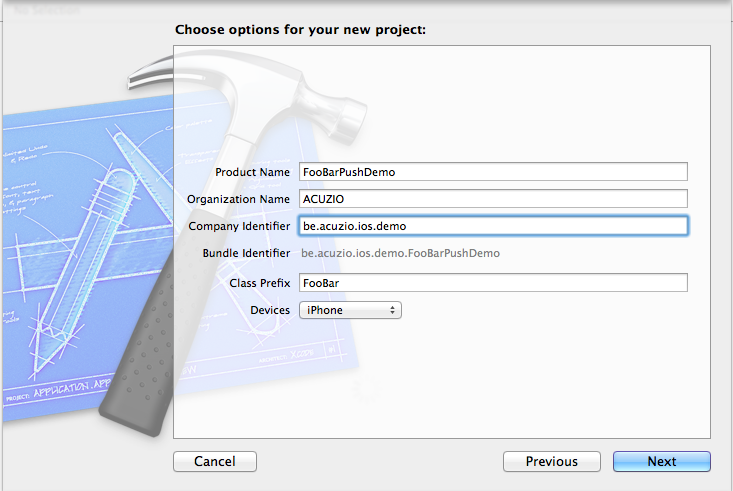 The bundle identifier in our example now is be.acuzio.ios.demo.FooBarPushDemo. 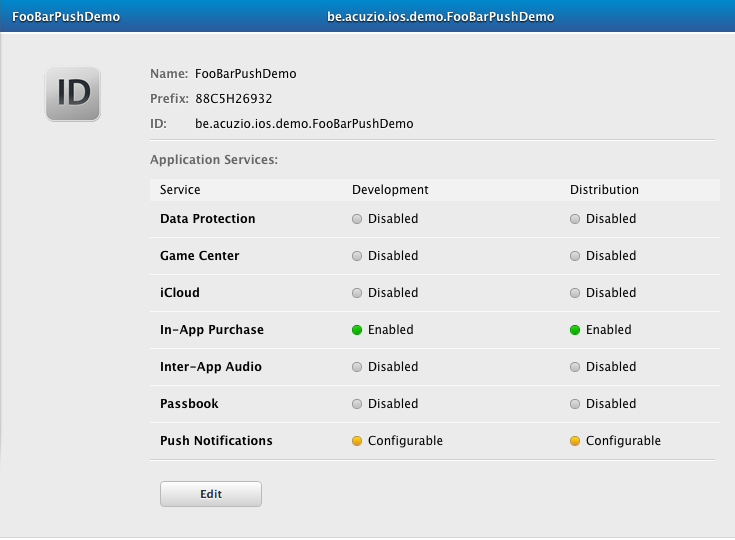 This bundle identifier will be need in the next steps when you create an App ID. 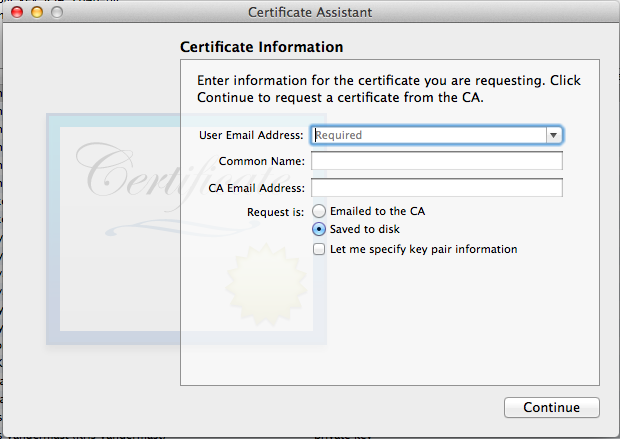 You will be informed that you will need a CSR file (see Step 1: Generate a Certificate Signing Request (CSR)). The first time you will be prompted for the Passphrase, which in this example is “foobar”. The second and third password will be to protect your newly created key. I chose the same “foobar” password, but you can choose a different one. This password will actually be required to set-up the SSL connection to the Apple Push Notification Service servers. In development you will be using the sandbox APNs, in production you will need the other one. When the generation finishes, click on “Download” and save the file next to the other certificates etc. This registration will show the user, when the application is first launched, a message that this app uses remote notifications. When you want to send a Push notification to a device, you need to open an SSL connection to the APNs servers using the generated certificate. When the connection is established, you can transmit a binary payload. If no feedback is returned, it means that the message was sent successfully! //make sure you're using the right dev/production server & cert combo!